Our Sinatra Sofa is as suave as they come. The bold use of metallic linen takes the Sinatra to another level of tailored sophistication. Its classic features are contrasted by the unexpected, avante-garde fabric. This variation of the Sinatra is ideal for the cutting edge individual. The Brixton Credenza is sleek and modern. Black Macassar doors and drawers in alternating directions adds a beautiful graphic quality to this piece. 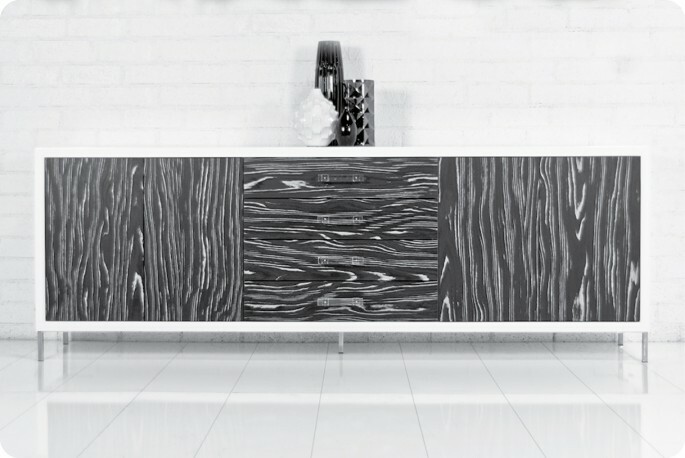 The clean white lacquer frame and clear lucite drawer pulls allow the dramatic black macassar to shine. And quite frankly, the contrasting wood grain is the star of this piece. 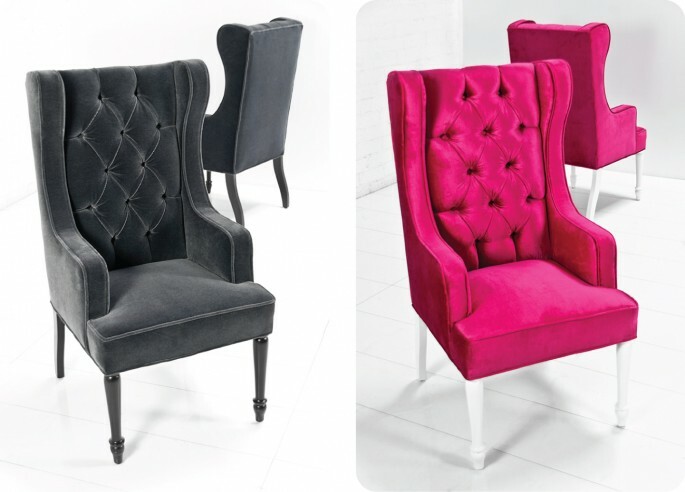 Bring a bit of drama to the dining table with our St. Tropez Dining Chairs. Ideal for either end of a large dining table with some smaller scale hard chairs mixed in, these dining chairs are both fancy and inviting all at once. Seen here in a slate mohair and sangria velvet, you can see how versatile the St. Tropez can truly be. The Trousdale bed embodies luxury and embellishment, while still maintaining a sleek and refined quality. The chrome gilded edge, tufted upholstery, and modern platform add a sophisticated aura to the bedroom. Slip into this posh bed and settle into the modern opulence that the Trousdale personifies. Our Bel Air Dresser in White Lacquer is as fresh as they come. A clean, simple frame on a recessed base sets the scene for details which make this dresser sing. The geometric molding and carved pulls give this Bel Air the glamour of old Hollywood with a modern twist. The Koenig sofa is a nod to classic Mid Century Modern designs if there ever was one. 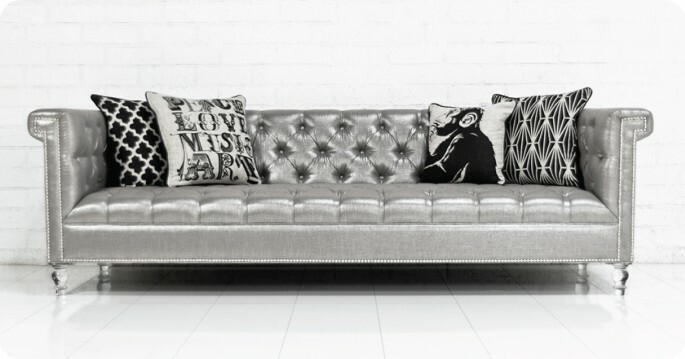 A tight, tufted back and seat makes for an extremely sleek sofa. Encased in a white macassar wood frame with cream colored cone legs, the Koenig would be a perfect piece to have floating in the middle of the room to showcase the dramatic wood grain. 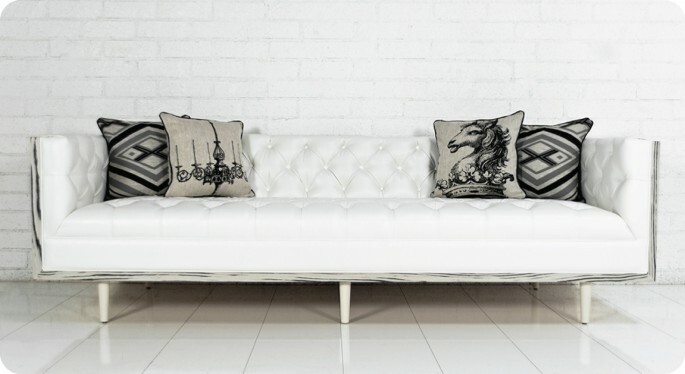 The white faux leather adds an unexpected lightness to the mix. 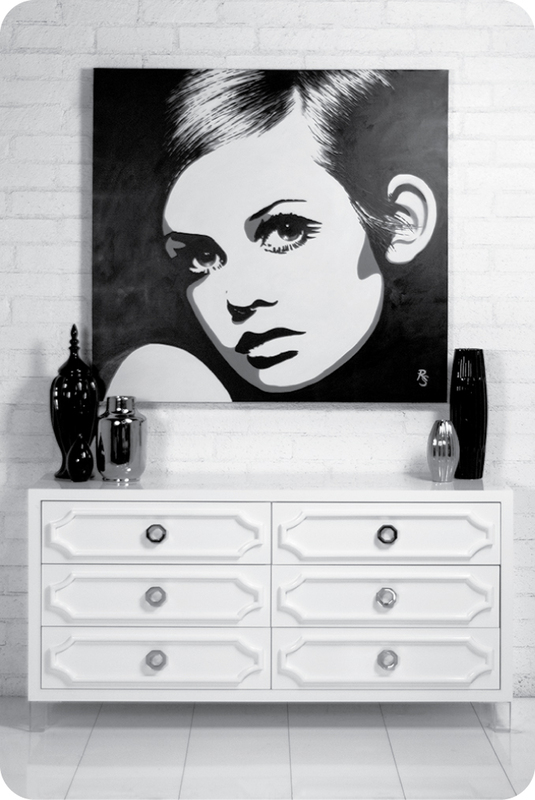 Our Hollywood Credenza is as glam as it gets. This Regency style piece features a geometric motif on all drawers, chrome octagon hardware, and lucite legs. For such a substantial amount of storage the Hollywood Credenza boasts, it’s incredibly light and airy in appearance. Go big or go home. The New Deep Sectional features a tight back and seat complete with button tufting. 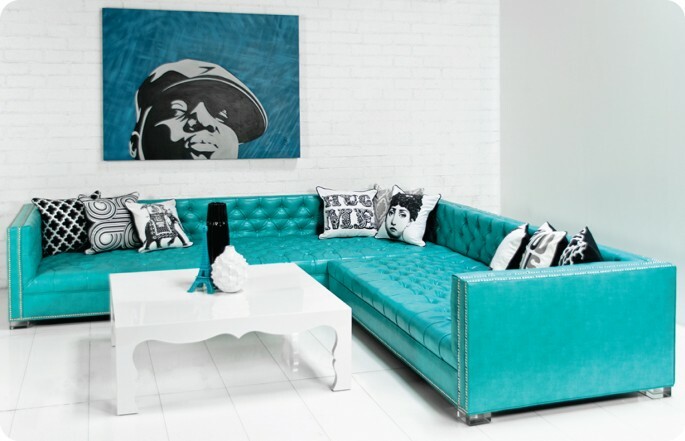 In a vibrant turquoise with chrome nail heads and square lucite legs, this is as modern a sectional as they come. Add a generous dose of throw pillows and the result is nothing short of magnificent. 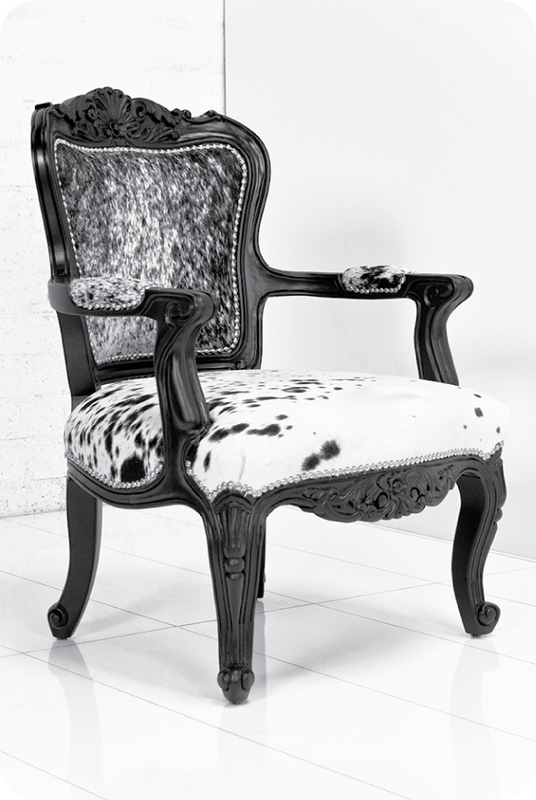 Our Bonanza Phillipe Chair is Rock and Roll meets Rococo meets Rancher. A classic frame with shell and acanthus motifs and scrolled feet are balanced by the edgy black lacquer, chrome nail heads, and salt and pepper cowhide. This is the ultimate example of Room Service’s signature modern twist and a must have for our more daring clientele. 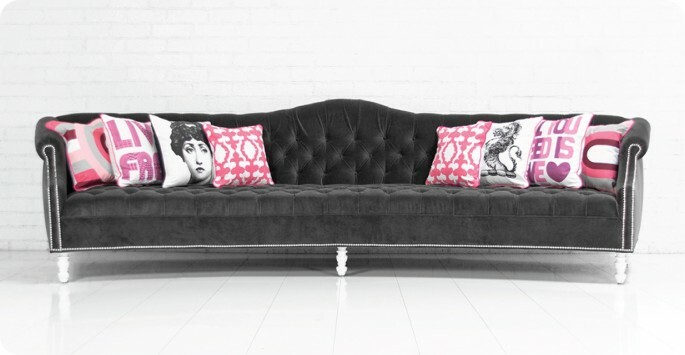 Our elegant Mademoiselle Sofa takes quite a turn. A modern interpretation of the camelback sofa, this Mademoiselle features graceful curving lines, both in the back and seat. Offering 12′ of seating, this variation of one of our best selling sofas is sure to be the focal point and leading lady of your living room furniture. Resembling our popular Riviera wing chair, this glamorous barstool brings a bit of pomp and shine to your bar or kitchen.The Riviera Barstool is all about the details. 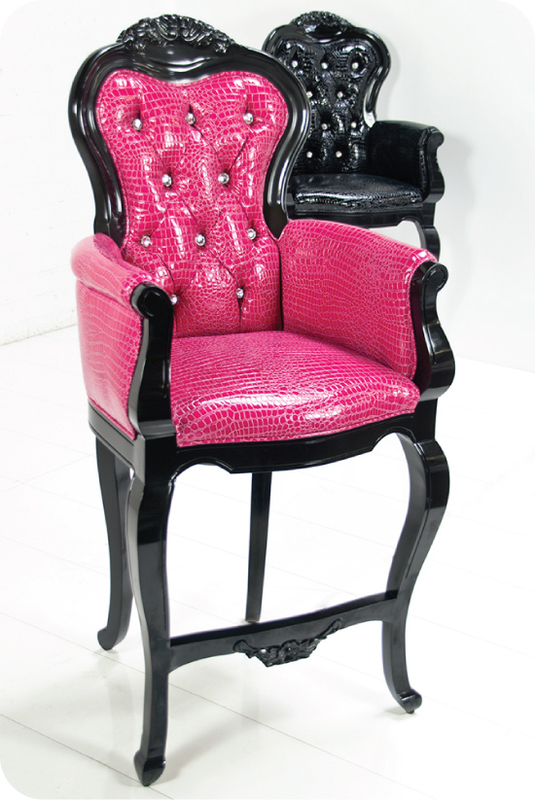 Black lacquer, crystal nailheads, and hot pink or black croc faux leather are all elements that really make for a barstool like no other.